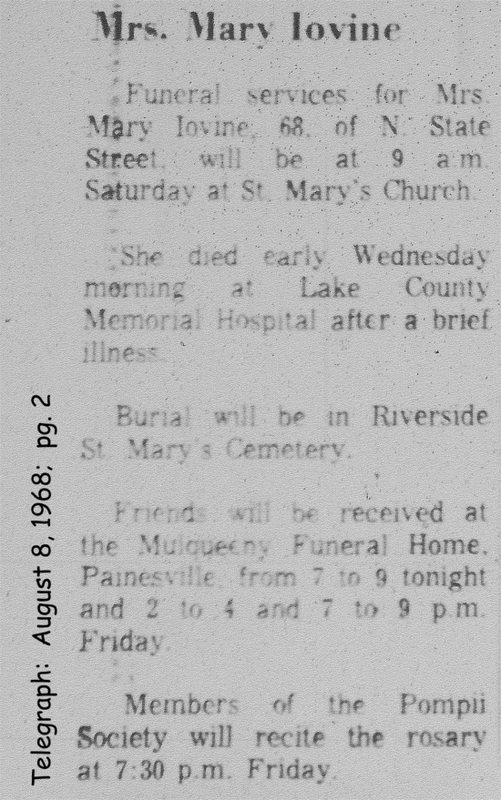 Maria Colarusso first appears at Painesville, Lake County, Ohio, in 1920. In America Maria Colarusso was known by her married name Mary Iovine. Maria Colarusso, daughter of Cosmo Colarusso and Maria Assunta Russo, was born on October 8, 1899, at Frosolone, Isernia Province, Molise, Italy. She was baptized on October 8, 1899 at Frosolone, Italy. Maria married Angelo Iovine, son of Leonardo Antonio Iovine and Domenica DiCristofaro, about 1920. Maria Colarusso died on August 7, 1968, at Lake County Memorial Hospital, Painesville, Lake County, Ohio. Her body was interred at Riverside Cemetery, Painesville, Lake County, Ohio. It is not clear where Maria Colarusso and Angelo Iovine were married. Angelo immigrated to Painesville, Ohio, in 1909. Their first child, Leonard Iovine, was born in Painesville, Ohio, in 1921. Maria Colarusso may have immigrated to the United States about 1920 and married Angelo in Painesville. Or, Angelo returned to Frosolone, Italy, they married, and immigrated to Painesville together in 1920 or 1921. Maria Colarusso, her husband, Angelo Iovine, and her son, Leonard Iovine, returned to Italy in 1921 or 1922. Angelo returned to Paineville in February, 1923. Maria and Angelo had children born at Frosolone, Italy, in the fall of 1925 and fall of 1927. So Angelo must have returned to Frosolone by late 1924. He re-entered the Uniteds States in June 1927. Maria Colarusso is shown as re-entering the United States on August 5, 1929. She was traveling to 120 Sanford Street, Painesville, Lake County, Ohio, with her three children to join the family’s father, Angelo Iovine, in Painesville, Ohio. They arrived in the United States at the Port of New York City aboard the ship SS Grande Conti. 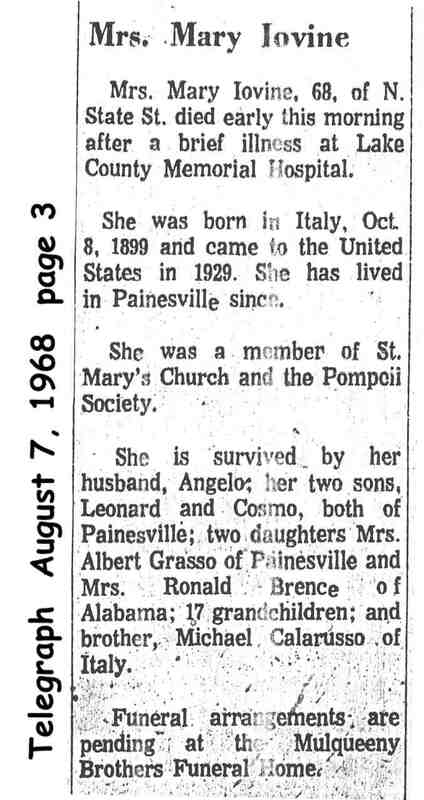 Maria Colarusso was enumerated for the 1940 Census of the United States, on April 6, 1940, living at 125 Prospect Street, Painesville, Lake County, Ohio, as a wife of Angelo Iovine. Maria Colarusso was enumerated as Mary Iovine. 1. Leonard Iovine was born on September 10, 1921, at Painesville, Lake County, Ohio. He died on Friday July 11, 1986 at Stoney Lake, Ontario, Canada, at age 64, in a boating accident. His body was interred at Riverside Cemetery at Painesville, Lake County, Ohio. Leonardo was born in the United States. His family returned to Italy in 1921 or 1922. His mother returned to the United States with her three children in 1929. 2. Cosmo Iovine was born on September 17, 1925, at Frosolone, Italy. Cosmo married Mary Jane Balland, daughter of Dewey Balland and Phyllis Lathrop, on August 7, 1952, at Lake County, Ohio. 3. Domenica Iovine was born on October 9, 1927, at Italy. She was married to Albert Grasso. 4. Mary Sue Iovine was born on September 15, 1934, at Painesville, Ohio. She was married to Ronald Brence.